Having enjoyed several visits in recent years to Kew, I recently bought a book called “The Plant Hunters”, by Musgrave, Gardner and Musgrave. (There are several books with that title). It is the story of several of the most legendary botanical explorers, who brought back exotic plants previously unknown in Europe and England, including many that I saw this summer in The Lost Gardens of Heligan. Fascinating! Hundreds of thousands of us enjoy gardening and visiting famous parks and gardens. Yet few of us, as we admire the beautiful and diverse range of plants around us, stop to wonder where they come from, and fewer still think about how these plants came to be here in the first place. How many of us, for example, know that the explorer who found over 300 rhododendron species was one of two survivors of a party attacked in a rebellious uprising and had an escape worthy of a member of the Special Forces; that the man responsible for establishing the tea industry in India single-handedly fought a gun battle with pirates while running a high fever; that the plant hunter who introduced many conifers to our landscape was gored to death by a bull; or that the discovery of the Himalayan rhododendrons resulted in a kingdom being annexed into the British Empire? The Plant Hunters: Two Hundred Years of Adventure and Discovery. While I was in the UK with my family, I tried for the first time the most divine drink: Fentimans Rose Lemonade. It is delicious on its own — it really smells like roses and tastes the way roses smell! And it’s pink! Just lovely. So here is the recipe for what my daughter calls “Rosie the Riveter”, although I’m trying to think of a more romantic, ladylike name to match the pale pink color with light green accents; and there is already a different cocktail named Rosie the Riveter, which I only discovered after I came up with mine and Googled the name. Maybe I’ll call it “Scepter’d Isle”, after Shakespeare and the gorgeous David Austin English Rose of that name, inspired by Susan Rushton’s beautiful photographs! What do you think? Fill a tall glass halfway with ice (cubes or crushed). Add one jigger of Hendrick’s Gin. Fill the rest of the glass with Fentimans Rose Lemonade. Add five drops of rose water, 1-3 thin slices of cucumber, one sprig of fresh mint leaves. Next stop: the bar “Fragrances” at the Ritz-Carlton, Berlin, which serves cocktails inspired by legendary perfumes. I’ve never been there, have you? I haven’t posted here in a while because I have been traveling in the UK with my family. We visited many beautiful gardens, but one of my favorites was The Lost Gardens of Heligan. Heligan is an old estate that once had hundreds of acres of formal, informal and tropical gardens, maintained by a staff of twenty-two. After World War I, when many of the workers did not return from the war, the estate slowly declined. The gardens were abandoned by the 1970s, while the main house was sold and divided into private apartments. We had cut our way through dense clumps of invasive bamboo, drawn towards a perfectly formed palm that stood sentinel at the entrance to what was obviously a walled garden. John Nelson and I were on another of our explorations, venturing deeper into the gardens each time. Today we were excited; somehow we knew it was going to be a special day. You can feel these things. Once inside, we paused for a moment. There was a sense that we were trespassing, that we had come upon a secret shrine. In the gloaming we could see dozens of trees growing thickly together, woven into a solid mass by an extremely vigorous climbing plant that covered everything like a furry blanket. We had never seen anything like this before. Under the trees we could make out shapes at once familiar and other-worldly. This was clearly the area of the garden where the real work had taken place. I don’t own the book pictured but I plan to engage in a lot of “garden tourism” soon. We will be traveling to Devon, Cornwall and Ireland this summer! I am so excited to see these beautiful parts of the world for the first time. We will actually start in Glastonbury then work our way down the coast counterclockwise, ending up near Torquay for a family wedding. What gardens in the Southwest of England are not to be missed, in your opinion? After the wedding, we will go to Northern Ireland and Dublin for a few days. I am excited to see the Giants’ Causeway and Trinity College, which my grandmother attended briefly many years ago. I know there will be many beautiful gardens to see in Ireland — which would you recommend? Thanks! 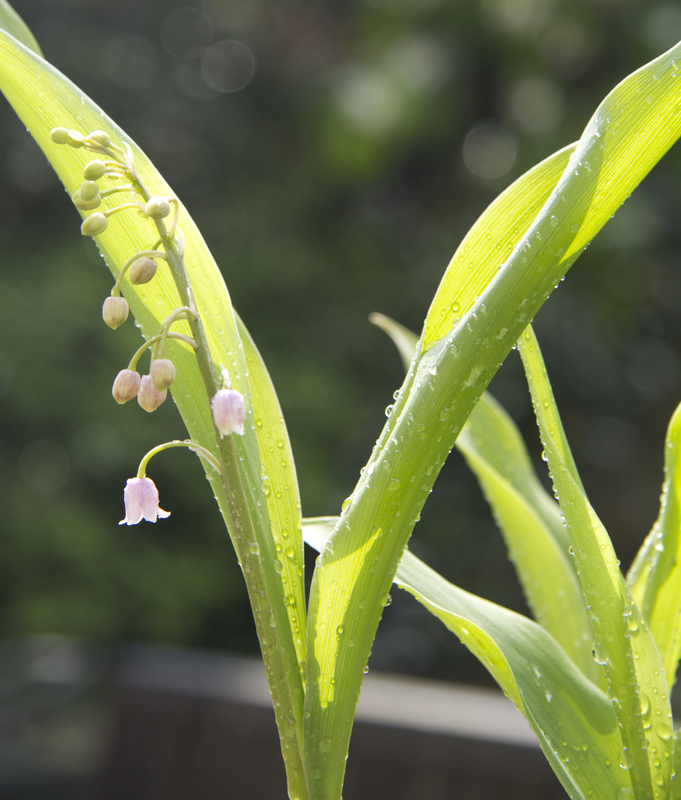 I spent the whole month of May posting about lily of the valley-based fragrances on my other blog, Serenity Now, in a series I called “May Muguet Marathon.” While I was doing that and reading a lot online about lilies of the valley, I came across a variety I have long wanted to try in my own garden, Convallaria majalis “Bordeaux.” It was on sale, so of course I bought 40 pips! My teenaged son helped me create a new planting bed for them by spreading many cubic feet of mushroom compost on top of the clayish soil between several old azaleas and the base of our house’s front terrace, a partly shaded area that is well-watered by our in-ground sprinkler system. He turned it in for me; I hope this will provide a suitable habitat! Lilies of the valley do not become invasive here in the South as they do further north; in fact, sometimes they struggle. Fingers crossed that “Bordeaux” finds a happy home here! Convallaria majalis “Prolificans”; photo from http://www.dobies.co.uk. David Austin Roses won another gold medal at the recent Chelsea Flower Show, and founder David Austin was honored with a visit from HRH Queen Elizabeth II. The Shropshire Star notes that both the Queen and Mr. Austin turn 90 this year and had a “good chat” about that milestone. What lovely faces and smiles they both have! 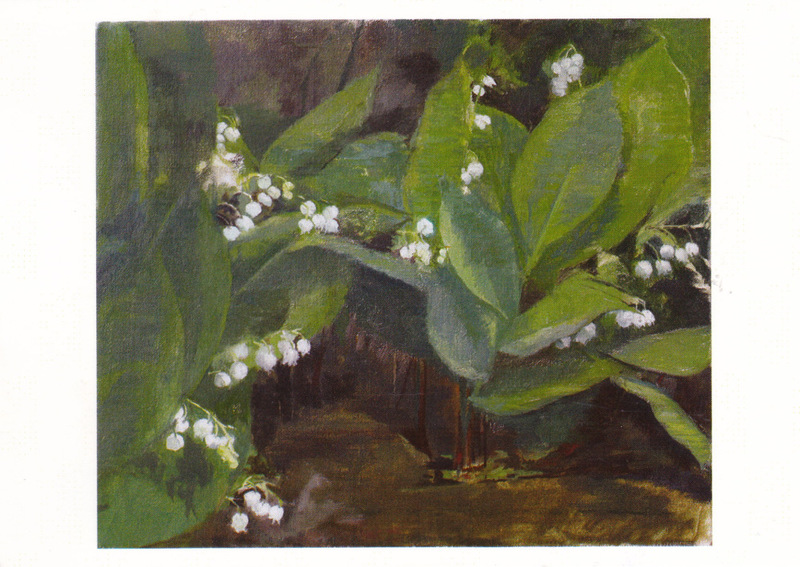 Garden and floral designer Non Morris wrote this lovely piece about lilies of the valley, a flower emblematic of the month of May, a couple of years ago. On the wooden table outside our kitchen door I have a terracotta pot of the most elegant pink lily of the valley, Convallaria majalis var. rosea. The pot was given to me as a precious container of newly planted bulbs by my friend the painter, Charlotte Verity . The gift was important as it was a memento of an extraordinary year Charlotte spent as Artist in Residence at The Garden Museum in London in 2010. Here in the shadow of the ruddy castellated walls of neighbouring Lambeth Palace, Charlotte spent a year painting in Tradescant’s Garden – the knot garden created in 1981 by the Dowager Marchioness of Salisbury around the important tomb of the Seventeenth Century plant hunters. Saturday Snippet: No Time to Read! Today’s chores, in addition to the usual weeding, spraying, watering: plant in containers two new Itoh peonies, bought for half-price from local nursery: “Takara” and “Julia Rose.” Plant nine new Hosta “Blue Mouse Ears” and Japanese painted ferns (they are gorgeous together — try it!). Plant nine new Phlox “David” in sunny border. Plant second “Black Diamond” crape myrtle into pot that matches the first one’s new home. Deadhead David Austin rose “Teasing Georgia”. Spread organic tree fertilizer under recently pruned oak tree. Plant more ceratostigma plumbaginoides under established Japanese maple “Filigree”, the idea being that the leadwort’s red autumn leaves and blue flowers will complement the fall colors of the maple. Finish replanting doorstep containers with summer plants. However, if I really get a lot done, I will likely treat myself to a field trip to see the new Chihuly exhibit at the Atlanta Botanical Garden, and that will be worth all the effort!